Stuart Lumb: don't tempt fate! Stuart Lumb, our proud Jet Set Super Vet (JSSV) had an interesting day at the British Cross Triathlon Championships in Coniston. Not unacquainted with the lanterne rouge position, a mid-race tyre explosion pretty much ensured that this time around! Yorkshire grit though, as that wasn't enough to stop Stuart making it to the finish line. As I pen this blog, the images of Alistair and Jonny Brownlee coming first and third in the Olympic Triathlon are etched into my mind, despite the rather dowdy trisuits they were required to be clad in. Spain's Javier Gomez might have missed out on gold but his trisuit definitely took first place and I suggest that the Spanish designer is contracted to design the GB kit for Rio 2016. Seriously. I'm immensely proud that had Yorkshire been a country we would have been in the top-10 for Olympic gold medals with Yorkshire athletes winning 25% of Team GB's medals – fantastic for one county, but hardly surprising! 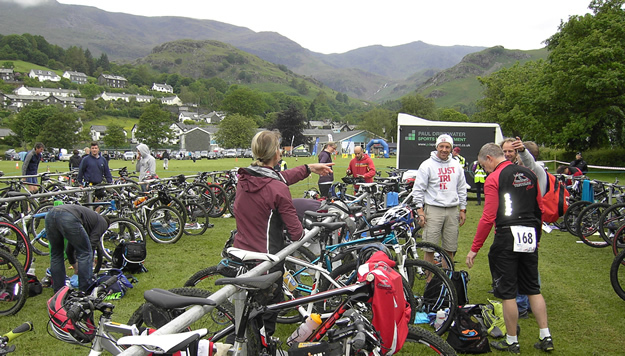 This blog is late as usual- well - I'm not Lanterne Rouge for nowt – but as we say better late than never.The GB Cross Tri Championships were held on June 10th in our beautiful scenic Lake District, in Coniston to be precise, organised in great style as ever by Drinkie – Paul Drinkwater of UKMTBTRI. The course was rather more demanding than the 2011 one (in Surrey), and a fitting test for off-road athletes. The weather preceding the race day was showery and I was checking the forecast anxiously, but eureka, race day dawned bright and sunny. It was great to see a number of the GB squad who would compete in Den Haag in the ETU event in July, although race conditions were vastly different. The swim was long by Cross Tri standards – supposedly 1.5km although Paul cheekily admitted it was a tad longer – plus the water was quite choppy, but all went well, although I nearly got lost trying to get back to T1. I have a disturbing habit of chatting and not remembering where I'm going. Must rectify for next season! I got out of the swim just in front of that amazing guy Pete Norman, the Welsh Wizard, and kept in front of him as we biked round the head of the lake, but as we started to climb up to the bike split which was around Grizedale, Peter shot past and I never saw him again that day (the reason will soon become apparent). 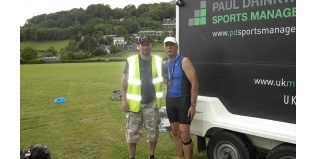 Incidentally, Peter races in the 75-79 AG and completed IM Lanzarote and Wimbleball 70.3 this year. Just hope I can do what he does at his age, plus whatever he's on – I want some! The 28km bike split was pretty technical and rated red, the same as the route I train on in Dalby. Well, it seemed more like black to me and I plodded on enjoying my own company, as is the usual case when JSSV races , pushing more than biking! I had just completed the circuit and was eagerly looking forward to the steep downhill descent back to T2 when there was this God almighty bang and looking down I could see a VERY flat back tyre. I nearly came off , in which case I would have been thankful to have had the protection of my Bell helmet , courtesy of DANISCO animal nutrition. On closer inspection I could see that a sharp piece of granite – there's rather a lot of it on the Lake District peaks – had pierced the side wall of my rear tyre inflicting a huge hole in it. It was then that I recalled a conversation I'd had with a friend on the Saturday, during which I'd said that I'd never had a blow -out in a race. I should learn to keep quiet I guess ! Being last as usual the broom wagon was in close attendance and Paul's marshalls, all great Leeds guys, offered me a lift back to T2. I politely thanked them and explained that would be an automatic DQ – plus I wanted my medal - hopefully . Well, it was a nice sunny day and I evolved a crafty technique of pushing my Anthem on its front wheel with my shoulder propping up the frame. Apparently BT's top brass was back at base waiting to dish out the gongs and after hearing of JSSV's plight enquired of Drinkie "what time's the cut-off ?" To which Paul replied "we don't have any – in any case it's light til 10pm!" I never found out what the reply was – probably as well - but I guess he had practically got back home by the time I finished. I duly staggered into T2, racked my bike and set off up Coniston Old Man. The views of the lake and the surrounding fells were stupendous, which eased the pain of a very taxing ascent accounting for roughly half the 7.7km “run” – I use that word advisedly - split. The run split meandered through Coniston Village itself until finally the finish loomed into view and I was cheered home by Paul, and his great crew, one of whom helped gather all my kit up and helped take it back to my car. In the meantime a delightful lady representing BT draped my medal round my neck, at which point I said many thanks for waiting for me! One advantage of finishing last is that its never hard to find my car – one of the two left in the large car park - plus its bright red – after which it was a case of loading up, saying thank you and good bye and heading south back to the one and only God's County. Paul has just announced that he is also hosting next year's GB xtri, again in Coniston, on June , plus his other race dates have also been announced so there's no excuse for not knowing about them well in advance .